On December 22, we had a Christmas party for about 35 boys. Each year, our day center closes for 6 weeks during the holidays. We encourage the boys to go visit their families during this time. Some do and some don't. For the younger ones that choose to stay on the streets during the holidays, they rarely bathe or wash their clothes. So needless to say, on the day of the party, we were prepared for some dirty, smelly boys! We pulled out some clothes that had been donated and offered a t-shirt and pair of pants/shorts to each boy as he came in. Sadly, most of the clothes were way to big for the boys but I handed out strips of curly ribbon to be used as belts! Once the boys were all nice and clean, the party started! Some friends of ours who also live here in Maputo, Dave and Amy, organized a bunch of fun games for the boys. We bobbed for apples (the first time the boys had ever seen that game!). We had a bubble-gum-bubble-blowing contest. We did the classic relay race of finding the candy in the plate of flour using only your mouth. We had a water balloon toss followed by a water balloon fight! And finally the boys made paper chains and blew up balloons to decorate. Meanwhile, Mama Julia was busy busy busy in the kitchen preparing 15 chickens (that we had killed and plucked the day before), salad, rice, and french fries. Before lunch was served, we gathered all the kids together and Luis told them all the Christmas story and talked about why Jesus came to live on the earth. If you've ever visited me in Mozambique, you know what a great story teller Luis is. He really gets into it! This story was complete with jumping up on one of our picnic tables to act out the part of the angel who appeared before Mary. Unfortunately, our tables are a little worn out and his foot went through the table as he was jumping down (sorry Ian!). Before the boys left, they each got a small present. For some reason, Lauren and I had the great idea of giving each of the boys a box of Pops....those little things you throw on the ground and they make a loud popping sound. Very quickly the boys discovered they could throw the Pops at their friends feet and scare them with the noise. A popping war broke out! And that is Christmas with the street kids. Beautiful, isn't it? Little David ran away from home over 3 years ago and has been living on the streets ever since. He recently decided he was ready to return home so we drove him there yesterday. His house is in a very remote village about 2 hours from the city. We drove to the house that his family lived in when he left 3 years ago but no one was home. After speaking to a neighbor, we realized his family had moved to a new house. Thankfully, David knew where this new house was located. Upon arriving at the correct house, David's aunt gave us chairs to sit in. One of his little cousins was quite scared of us because she had never seen white people in her village. She ran away when we first walked up but soon came back to see why we were there. Luis, my coworker, began introducing us to the aunt...."Sarah, Lauren, Luis." Lastly, he pointed to David and said "and this young man you already know." The aunt shook her head no and took a better look at David's face. About the time Luis said the name "David" you could see the look of recognition registering on the face of his aunt. And then the tears of joy started falling. David was crying. I was crying. Lauren was crying. The aunt was crying. And shouting. And jumping up and down. And running to call other family members. Another prodigal son is home. I'M BACK IN MOZAMBIQUE!!! When I arrived this past Sunday, I was greeted at the airport by a group of the Masana boys holding a banner they had made spelling out "Tia Sarah." It was a beautiful welcome. We had a dinner that night with the 6 boys living with us and a couple of other missionaries who have become dear friends. Monday was a super fun day at Masana to celebrate my return. There were 40 boys here to celebrate! 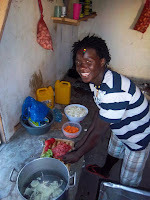 My housemates and the Mozambican staff had planned a special lunch and even put together a drama about my time in America so that all the boys would understand a bit more about my cancer treatments. It's so great to be home! It is 8:00 in the morning and I am sitting in the Washington Dulles airport waiting to board an Ethiopian Airlines flight bound for Maputo, Mozambique. My heart is full of so many emotions. 227 days ago I called my doctor in South Africa for my biopsy results. Breast cancer. Then I made the hard decision to leave my home in Mozambique and return to Georgia for treatment. When I left Mozambique on March 13, I thought I'd knock my treatments out quickly and be back in June. Guess I was wrong. Today is October 8. My last radiation treatment was yesterday. 7 months in the States going through treatment. So here I am. I just said goodbye to my family and friends who have been so amazingly supportive these past 7 months. I'm so excited to be on my way back to Mozambique but I'm also a bit nervous. 7 months is a long time to be gone. I mean I definitely look different than I did in March when I left! Gone is the long, curly, red hair and I am currently a very short blonde. What will the boys think and say when they see me? Will I remember their names? Will I remember how to speak Portuguese? Will my limited knowledge of the language allow me to communicate how deeply I have missed them all and to share about my journey through cancer? Will I remember how to drive on the opposite side of the road with crazy, aggressive drivers? Will I remember the names of roads? Will I be able to pick up right where I left off in March? Will Maputo still feel like home? So many questions. But not one that can be answered until I am there. I can choose to continue dwelling on these worries for the next 20-something hours or I can give them to God and trust that He is walking this out with me. I choose the latter. I take comfort in my Father's voice. "Fear not. I am with you." 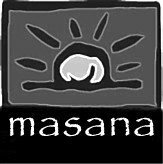 In January 2009 I began working with Masana. I was the only non-Mozambican on staff. And I loved it!!! I love that it was a group of Mozambicans with a passion for their own children. In the years since I began working with Masana, the project has grown and changed a bit. In 2010, Ian Krohn, from America, and Lauren Nixon, from South Africa, joined our staff. We moved the project to the house that Ian, Lauren and I live in where we have much better facilities. But our heart remains the same: to help street kids reach the place that they are ready to leave the streets and return to their families . . . to see their hope restored. Each day, around 30 boys ages 8-18 show up at Masana as soon as the sun rises. They get breakfast and lunch with us. We provide them with a place to shower and wash their clothes. We teach basic literacy classes . . . the first schooling that many of them have ever had. We provide basic first aid and medical care when needed. We have a soccer program for the boys, to allow them time to just be boys and play. Each day, we have a worship service and a time of teaching from the Word of God. We use this time to talk about life on the streets and how God has better plans for their lives. And then we leave it up to the Holy Spirit to really move in the boys and bring them to the place that they are ready to change. When a boy decides to return home, we go visit his family. The majority of the time, the boys have run away and have decent families that they could be living with. We meet with the family members to discuss why their son is on the streets and whether or not he is welcome to return home. The boy then enters into a one month transitional phase in which he lives at the project. We use this time to help the boy get use to having some responsibility again as opposed to the complete freedom they are use to on the streets. We also spend time together in the Word with a focus on God’s heart for family and teaching the boys Godly characteristics they need to work on in order to succeed back at home. At the end of the month, we take the boy back to his family with a suitcase full of clothes, blankets, a sleeping mat, and other basic necessities he needs to adjust back to life with his family. We register the boy for school in his community and provide his uniform and school supplies. For the older boys, we help them start up a small business. We visit the boy and his family on a monthly basis for the next year. We make ourselves available anytime the families need us. Our hope is that, rather than running back to the streets when something goes wrong, the boys will learn to work through their problems. Time and time again, the families call on us to be there and help mediate through family issues. Since 2009, we have helped over 30 boys return to their families. Not all of them are still at home today but the majority of them all. That is the heart of Masana. Restoring the hearts of the children to their fathers and the hearts of the fathers to their children (Malachi 4:6). We have dreams for the future . . . ways we want to invest in the lives of these boys and their families on a deeper level. We want to have a skills training program so that we can help the older boys get jobs. We want to start a farming project, employ some of the boys, use some of the produce for the daily meals at Masana and sell the rest. We want Masana to be self-sustaining rather than dependent upon foreign funding. As I think about these dreams for our future, I am encouraged by God’s faithfulness already. And I have hope that these dreams too shall come to pass. About halfway into my first year in Mozambique, I found myself wanting to spend more and more time among the street kids. The weekly church service with them and the afternoons out in the city when I would run into some of the boys became the moments when I felt most alive. Though working with Iris Ministries was a safe place, I knew God was pushing me out of that comfort zone. I met with the directors at the Iris center and shared my heart with them. At the time, I did not know of any projects working with street kids full time but I knew God was calling me to step out in faith. Within a week of telling the directors I would not be returning for another year at the center, I was invited to a meeting with a friend. She was in Mozambique from New York and was trying to connect with different projects around the city. This particular meeting was with a pastor she had been told about that worked with street kids. At this meeting, Pastor Paulo, told us all about Masana, a day center for street kids that focused on helping the kids return to their families. As he described the project, it was word for word my heart. I felt God opening the door. And, as if it wasn’t clear enough, Pastor Paulo said that they had been praying for a missionary to work with them. I was blown away by God’s faithfulness! I had decided in my heart that I would just move to the city and start hanging out with street kids, seeing where they went each day, and looking for opportunities to help out. But again, God in his kindness had such better plans for me!!! Now if you'll remember from part 1 and 2 of my journey, I had often questioned whether God was calling me to the nations or the inner city. I was passionate about both! In moving to Mozambique I thought I had chosen the nations. But God, in his faithfulness, was giving me both of my passions....the inner city in Africa! So here I am about one month after moving to Maputo. One of the other missionaries, Brooke (who became a dear friend!!) and I decided to check out the street outreach. We loaded up in the van with some visitors and older youth from the Iris center. When we got to the city, we gathered street kids and had a church service. That night I met 2 little boys, Gaspar and Zacarius. These brothers became a huge part of my life. At the time, Gaspar was 7 or 8 and Zacarius was around 9 or 10. They were new to the streets. I was drawn to them because they were so little and you could just see the fear in them. We ended up taking both of them back to the Iris Center with us that night. Brooke and I let them shower in our house and found some clean clothes for them to wear. The joy on their faces was like a child on Christmas morning! The next day, some Mozambican workers spoke with the boys and tried to sort out their family history. It turns out they had both run away from home. The workers made contact with the boys’ father and he agreed to take Zacarius but refused to take little Gaspar. He said Gaspar was just too much trouble. So Zacarius went home with his dad while Gaspar began living at the Iris Center. A few weeks later, Brooke and I were in the city and saw Zacarius on the street. We spent some time talking to him about why he had left home again. He claimed his father was abusive. Though it saddened me greatly, I knew we couldn’t take him back to the center since he had already been placed back with his father. I began looking for Zacarius every time I went to the city. We found out his mother lived not far outside the city so we began offering to take him there. Eventually, he said yes so Brooke and I took him home and met his mom for the first time. That day began a cycle of Zacarius staying home and returning to the streets that continues to this day. With the company of a couple of Mozambican youth from the Iris Center, we began visiting Zacarius every few weeks at his home. Every time we went, the kids from the village would come from everywhere to see us. With such a captive audience, we began teaching Bible stories. We discovered that, as long as Zacarius knew we were coming back, he wouldn’t run away so we began going every other week and then every week. Eventually it turned into weekly children’s church sitting on a mat outside of Zacarius’ house with anywhere from 10 to 30 children. After returning from my first trip to Mozambique, I knew I’d be going back and I began to plan for that. It wasn't a grand, supernatural calling from God but simply a knowing in my heart that that was where He was directing me. I had already committed to being at the Wesley Foundation the next school year so I knew it would be almost 12 months before I could return . . . a season of preparation. And it was a wonderful last year in Athens and at Wesley. The Lord renewed my passion for my ministry in the inner city. God, in His kindness, brought me to a place that it was actually hard to leave Athens. And this was a gift as my years at Wesley had been so instrumental in my walk with God and it’s allowed me to continue to carry Wesley in my heart. Though Wesley is not really a place you go back to after leaving, I have continued to consider it my home church and have been blessed by my continued relationships with Bob and a handful of the directors. As the year ended and my passion for the children's ministry in the housing projects was renewed, I again found myself questioning whether God was calling me to the nations or to the inner city. In May, 2007 I took a second Wesley mission team to Mozambique and we spent 3 weeks at the Iris Children’s Center just outside of the capital city. This time, when the team left, I traveled to northern Mozambique and attended a 3 month ministry school led by Heidi and Rolland Baker. It was an incredible summer of really learning about the heart of this woman that had been the focus of life changing prophecies spoken over me. After the ministry school, I spent 4 months in the States raising support before moving to Mozambique in December. 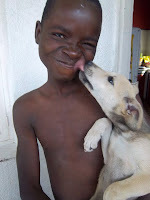 My first year in Mozambique, I was working at the Iris Children’s center near the capital, Maputo. I started helping out with a weekly outreach among the street kids. So less than one month after moving to Maputo, I had my first interaction with street kids and, little did I know, it would be the beginning of what is now my full time ministry!! 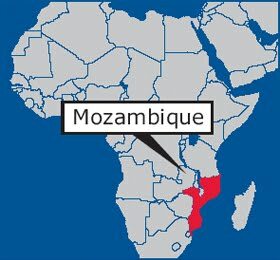 In anticipation of my return to Mozambique in just a few days, I thought I'd take some time to share how I ended up as a missionary in Mozambique. As I look back over the years and steps that led me to where I am, it is a beautiful journey orchestrated by God. I pray that as you read of God's faithfulness in directing my steps, that you will be encouraged. His Word says, "Lean not on your own understanding but in all your ways acknowledge Him and He shall direct your path." That promise is for you!!! In 2005, I was working at the Wesley Foundation. I was the director of children’s ministry and oversaw 3 programs in the low income housing communities around the UGA campus. The 2004-2005 school year was my 4th year leading these ministries. My job had become so administrative that I was beginning to lose my passion for it. In the summer of 2005, I went to a service at Daystar Church in Atlanta where I received a prophetic word about a ministry among the poor similar to that of Heidi Baker. I had never heard of Heidi Baker at this point so I called a friend, Clay Kirkland, on the way home and asked him who she was. He just kept saying “Serious power! Serious power!” When I got home, I looked her up on the internet and found links to her ministry in Mozambique. Right away, I emailed about the possibility of bringing a team from Wesley. A couple of months later, I was at a random church that met in a barn in Social Circle. They ended up prophesying over my friends and me. The words given to me were again relating to Heidi Baker and a calling to sit in the dirt with the poor. In May, 2006 I took my first trip to Maputo, Mozambique and spent 2 weeks at the Iris Ministries children’s center. As both a student and staff member at Wesley, I had been on mission trips all over the world. But this was the first trip where I really fell in love with the people and had a hard time leaving. From the moment I returned to Athens, I began wrestling with the Lord about my calling. I was drawn to the passage in the Gospels about the woman who anoints the feet of Jesus with the expensive perfume and the verse in 2 Corinthians that says, “We are to God the aroma of Christ among those who are being saved.” For the first time ever, I found myself questioning what my life was being poured out for and whether or not I was where God wanted me. Was God calling me to the nations or to the inner city? As I write this post, I am recovering from my last round of chemo. It has been quite the whirlwind since I was diagnosed with breast cancer in February. This season of my life has definitely been the hardest. There were definitely some hard days and I have hated being away from Mozambique and all the street boys we minister to. But I know that God has purpose in it and that He will reveal those purposes to me in time. Until then, I continue to choose to walk with Him each day, trusting that He is in control. I will start my radiation treatments next Monday and when I complete them at the end of September, I will be on the first possible plane back to Mozambique!!! In Mozambique, there are 2 other full time missionaries as well as 6 Mozambican staff members that I work with and they have done a wonderful job of carrying things in my absence. Since January, 8 boys have left their lives on the streets and returned home! Most of them spent a month living at our project prior to returning home where they were able to receive more in depth teaching on family as well as have a time to get used to having rules and responsibility again. There have also been around 15 street boys that have stayed for a few nights, as they’ve needed a place to recover from sickness or injury. The project continues to average around 30 street boys a day at our day-center. Those 30 boys are daily lavished in the love of the Father through the missionaries and workers and taught from the Word of God. Their basic needs are also met as they receive breakfast and lunch, are taught basic literacy education, and have a place to shower and wash their clothes. As I prepare to return to Mozambique, I am doing my fundraising for 2012 since I won't return to the States til the end of next year. I have to raise around $23,000 for the year. If you are able to help, it would be much appreciated! All gifts are tax deductible. If you want to give online, you can do so at www.unveiledfaces.co by clicking on “Mozambique – Sarah Olds.” Or you can mail a check made payable to Unveiled Faces with "Sarah Olds" on the memo line to: Unveiled Faces, PO Box 8235, Atlanta, GA 31106. If you are interested in giving on a monthly basis, please let me know and I’ll help get that set up. Thank you for all of your prayers and support as I’ve battled this cancer. I truly believe that my experience with cancer – from surgery to chemo and hopefully radiation too – has been easier than expected because of the great cloud of witnesses I have surrounding me in prayer and encouragement. Sorry for abandoning the blog. I have a CaringBridge site that I am using to post updates on my cancer treatment. You can access it by clicking here. I am in regular contact with my housemates in Mozambique and things are going well with all the boys. I still miss them so much. When I finish chemo at the end of August, I will be able to go to Mozambique for a month before returning to start radiation. I can't wait!!! It has been over 8 weeks since I was diagnosed with breast cancer. And suddenly my life looks so different from anything I imagined. I miss Mozambique. I miss my beautiful boys. I miss being woken up at 6:00 in the morning as the littlest boys arrive, gushing with joy to see us. I miss being a part of restoring families as street kids choose to leave the streets and return to their families. I miss visits in the villages as we check in on boys who are beginning life back with their families. I miss 5:00 tea on the rooftop with my housemates. I even miss the frustrations of my life there....being ripped off at the market because I'm white or dealing with boys who steal from the very hands that care for them. I miss Paito's humor and Tilfo's quite strength. 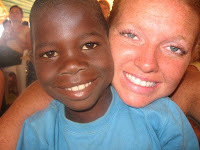 And oh how I miss sweet little Felix and that grin of his that could brighten any day. It's hard to be content here when my heart is 8,643 miles away. I can't stop the tears when the doctor tells me it will be at least 2 more weeks before we have the test results back on my tumor and can make a decision about the next step in my treatment. And the tears really come as the doctor explains that, if chemo is necessary, it would be 3 or 4 months of treatment followed by a month and a half of radiation. My heart breaks at the thought of having to be away from Mozambique for that long. I find myself praying constantly for God's mercy that chemo will not be a part of my treatment. And it's all selfish, these prayers of mine. Because I just want to be back in Mozambique...not because of the work that I have to do there or the decisions that need to be made at the project. Those things happen with our without me. No, I want to be back because its there that I feel most alive . . . sitting on the back porch helping Felix with his reading or walking to the pharmacy with yet another boy covered in sores or dishing up heaping servings of rice and beans for 35 boys. They don't need me. I need them. I have no doubt that I'll beat this cancer. I'm not afraid. I know that my God is good and will never leave me. I know that He promises to work all things together for good. I know that He has a plan for me...to prosper me and not to harm me. I am confident in His love. It's the waiting that is the hardest. Waiting to go home. So the surgery is done! I went in on Wednesday and had a lumpectomy and a biopsy of lymph nodes. It was an out-patient procedure so I was back home by 7pm. And straight to bed. At first, the pain was pretty bad but its getting better now. So now I get to sit here and recover because the sooner I recover, the sooner I can start radiation and the sooner I start radiation, the sooner I finish radiation and the sooner I finish radiation, the sooner I return to Mozambique! So what does recovery look like for me? Reading lots of books. Yesterday I read "Quaker Summer" by Lisa Samson. Today I'm starting the "Mark of the Lion" series by Francine Rivers. If you have any good book recommendations, pass them along! I go back to the doctor on Tuesday. The doctor should have the results from my pathology by then. They are running tests on both the tumor and my lymph nodes. I hope to find out more about radiation as well and begin getting that set up. Thanks for continuing to remember me in your prayers! Please pray for a speedy recovery from surgery. I wanted to let you all know that I will be having surgery this Wednesday morning. I am having a lumpectomy which means the surgeon will remove the tumor. So far, it appears the cancer is located in one place which is great news! The tumor will be sent to a lab where a few tests will be run but as long as things come back as the doctor thinks they will, no chemo! Once the incision heals, I'll begin 5-7 weeks of radiation. I have been told that it takes anywhere from 2-6 weeks for the incision to heal and before radiation can begin. Praying its more on the 2-week side of things!! As far as I know, the surgery is outpatient so I will be back at my parent's house Wednesday evening. Thanks for continuing to carry me in your prayers! As of this past weekend, he is the 3rd boy we've invited to leave his life on the streets and live with us. Taking in boys to live with us is not our norm as we very much have a heart to see the street boys reconciled to their families. But with Tilfo, Paito, and Felix, the 3 boys living with us, we feel like God has something special in store for them that me and my housemates are to be a part of. We are not exactly sure how old Tilfo is. He thinks he is around 15. His documents say he is 19. I think 15 or 16 is a more accurate guess. Here in Mozambique, its common that a child will not have official birth documents so years down the road when someone has documents created, a birthdate is created. Both of Tilfo's parents passed away. He spent 7 years living at a children's center where he studied through the 7th grade. Tilfo left the children's center in 2009 and started living with an uncle and aunt. He encountered some problems in their home and decided to leave. That's when he started living on the streets and became a part of Masana. Tilfo is an amazing young man. He is very gentle and patient. He is quick to help with anything that needs to be done. He's a talented soccer player and does very well in school. We are so excited to have him in our home and a part of our family. In the next few days, we'll arrange for him to study at a school near our house. We'll also be going to visit his aunt and uncle. This will be the first time that Tilfo has spoken to them since he left their home a year ago. Please keep Tilfo in your prayers as he settles in here, begins school, and starts the process of being reconciled with his family. Friday we visited 3 boys to make sure they were all set for school. It is rainy season here in Mozambique and it rained so much on Thursday that we had to cancel our visits. So we are a bit behind schedule and having to squeeze more into each day. The rain also makes for interesting driving in the villages around Maputo! I drove through some pretty deep holes/ditches full of water. And I'm no expert on driving in these type of conditions so i just choose a side and drive! Thankfully God protected my car!!! We were able to get Janario all set to study in grade 3. He is 11 years old and has been off the streets since June. Next was Marcus who is 14 and also returned home in June. He'll be studying in grade 5. Finally was Abrantis...whom I affectionately call "Malouco" (crazy person). Abrantis is 15 and has been home since last February. My first year working at Masana, Abrantis was one of the boys I was closest to. He would wash my car for me every week. Every sunday, he would bring a bag of frozen food to my house and ask to heat it up. He brought me a pet bird named Sarina and then took me on a bird hunt to show me how to catch birds. We had a special bond! Since he went home, he's twice taken me and some friends to a small, almost deserted island near his families house. He's a great kid! This year he'll be studying in the 6th grade. Matusse’s real name is Sadik. Many of the boys make up names for themselves when they begin living on the street so that they don’t have to reveal their true identity to others. When we reintegrated Matusse with his father back in November, we learned his real name. Matusse is 14 years old. He’ll be studying in the 5th grade this year. Matusse has had a hard time since he returned home. Just before Christmas, he got into trouble and his father kicked him out of the house. On today’s visit, when we should have been focusing on Matusse’s school registration, we were sorting through this family dispute. We had a 4 hour meeting with Matusse, his father, his sister, his stepmother, and the chief of their village. Matusse’s father was trying to forbid his son from living with his sister as well. So the chief of the village intervened to mediate through the dispute. In the end, Matusse’s father was forced to give Matusse all of the things we had purchased for him (clothes, blankets, and a small business) and grant his son permission to live with other family members. The ending was good but it was a frustrating situation. I’ll never understand how a father can kick his son out rather than forgive him for his error. Please keep Matusse in your prayers as he adjusts to living with his older sister. His father lives very close to this sister so there is still hope for their relationship to be restored. Gito is 16 years old. He returned home in May, 2010. He lives with his father and stepmother. Gito truly lives in the “bush!” To get to his house, we drive about an house, most of which is on a dirt road. Then we turn off the dirt road onto a road that isn’t really much of a road but more of a path with really overgrown grass between fields of corn. We drive as far as we can and then walk the last 10 or 15 minutes to Gito’s house. Last year, Gito completed the adult literacy program and passed his 5th grade exam. He will be studying in the 6th grade this year. Unfortunately, Gito lost the document saying he passed that exam so we’ll have to return to his old school and get a new one before we can complete his registration. Sometimes the registration process can be quite time consuming. For many Mozambican families, this is a deterrent because it costs money in transport and fees to get these documents and they just don’t have the extra money. So this becomes one way that Masana is able to bless these boys and their families! January marks the beginning of a new school year here in Mozambique. The couple of weeks leading up to the first day of classes is when all of the kids register for their grade. Sadly, some kids have families that don’t really place a high value on education and these kids end up not attending school. At Masana, we believe that education is very important. When we reintegrate a boy back with his family, we commit to paying all school fees and buying school materials for at least a year. That means that, during this 2 week period in January, we visit all of the boys that we’ve reintegrated in the previous year. It’s a lot of work but its so worth it because it gives us a chance to check in with all of the boys and their families and see how they are getting along. So over the next 7 days we’ll visit Gito, Matusse, Reginaldo, Marcos, Fred, Semera, Abrantis, Juma, Janario, Luis, Paito, Fabiao, Manuel, and Pai. Stories to follow!